Lui, Charles; Tanja Srebotnjak and Renee Yuen-Jan Hsia 2014: "California Emergency Department Closures are Associated with Increased Inpatient Mortality at Nearby Hospitals.". 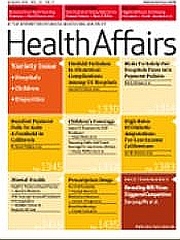 Health Affairs, Vol. 33, No. 8, 1323-1329. "How Much Will I Get Charged for This?" Lui, Charles; Tanja Srebotnjak and Renee Yuen-Jan Hsia 2014: “California Emergency Department Closures are Associated with Increased Inpatient Mortality at Nearby Hospitals.”. Health Affairs, Vol. 33, No. 8, 1323-1329.